The 76ers got a stirring victory over the Celtics as they stunned the men in green with an 18 point comeback. Down big and on the verge of having to go into Boston to fight for their playoff lives, Andre Iguoldala came up big, knocking down key shots including a shot clock beating triple. Iguodala high scored for the Sixers with 16 points while Evan Turner also had 16 but shot at just 5-22 (22%) from the field. Rajon Rondo was the Cs best, or at least close to it, with 15 points and 15 assists while Paul Pierce had 24 points on one knee. 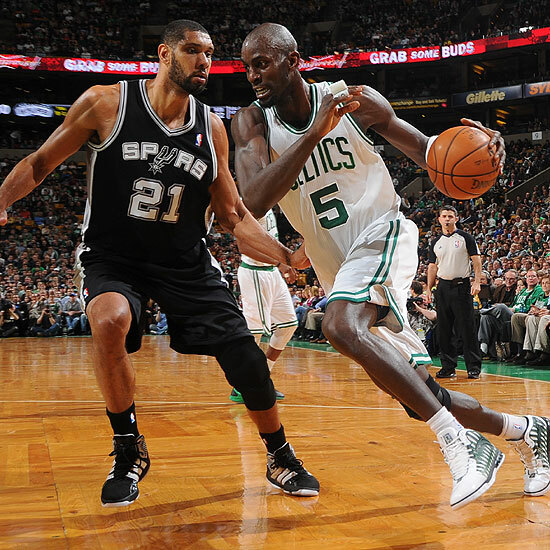 Yet it seemed that the offence did not go through Garnett enough, as he had only 9 points. When he has a big night and gets lots of touches, the Celtics seem to win. When he does not, they appear to struggle. An interesting thought to carry into Game 5 in Boston. A vintage performance from Kevin Garnett and yet another triple double from the seemingly unstoppable Rajon Rondo just allowed the Celtics to clear the Sixers at home; 92-91. Few players seem to have the ability to control the flow of a game like Rondo can, who almost always knows when the right time to pass and when to score. Rondo finished with 13 points, 12 rebounds and 17 assists in a dominant performance. Rondo continues to show that he is the most important Celtic, helping them win even with Pierce having a minimal impact. The Sixers did leap out to a big first half lead, led by Iguodala who finished with 19 points on the night, but the Celtics continued to grind all night as they whittled down the sizeable lead. Powered by the crowd, the Celtics kept up their seemingly unstopable form at home and took an important 1-0 lead. 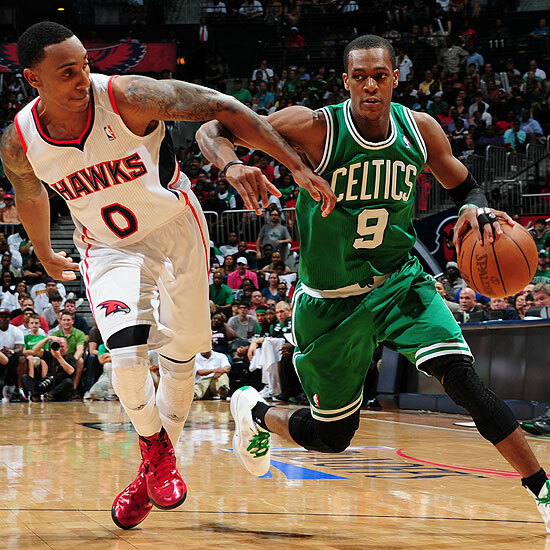 The Atlanta Hawks barely escaped elimination with a one point victory over the Boston Celtics. Al Horford came up huge for the Hawks with 19 points and 11 rebounds to lead his team in a game he was not even supposed to be playing in. All starters scored in double digits for the Hawks. Josh Smith had 22 points and pulled down 18 boards as the Atlanta Hawks took full advantage of their home court as the won their first game of the series against the Boston Celtics. Kirk Hinrich provided a big lift, giving the Hawks a 12 points on 4-6 shooting from downtown. The Hawks jumped out to a big lead early and were only just able to fend off a determined Celtics fight back. The Celtics did not hit a single three as Ray Allen continued to sit out with his bung ankle. The C’s certainly missed his presence as they did not hit a three for the game. Rajon Rondo had 20 points and 11 assists before being ejected after a stoush with a referee. Perhaps the most important decision that will be made in this series is whether the league decide to suspsend Rondo. Kevin Garnett had 20 points as well. It’s doubful whether this loss will effect a veteran team like the Celtics that much. They’ve been in this situation and know that it is not the be all and end all. The return of Allen is essential as it opens up lanes and shots for all others as they have to stick right on Ray. No help will be coming from the two guard as Allen will hit that shot with an iota of space. No injuries for either side. The Boston Celtics appear to be going through the same kind of routine that this veteran team do every year. They start fast, fade and then make a sudden run to the playoffs, where they are as dangerous as any team in the league. Even though it seems to happen every season, it’s still somewhat unexpected when they pick themselves up. Their win against Miami on Monday (our time) was huge. They showed the world that they can beat the best in the East. Not just beat, but in this case completely maul. Their definite advantage against Miami at the point guard position shone through with Rajon Rondo turning in a massive triple double, absolutely dominating Mario Chalmers. Injuries like usual will play a key part in their playoff hopes. Ray Allen is currently out with a bung ankle, which- as a shooter -he relies on his usually unfailing legs for lift and stability. The hope is that he will be able to return and still shoot and play at the amazing level that he had been. Allen’s health will be a key factor, as will Kevin Garnett’s ability to continue playing at the centre. The Celtics have been a much better team after KG accepted Doc Rivers request to play as the man in the middle. KG gives up little to most of the centres in the league and is able to general the Celtics still suffocating defence. Defence is something that has stayed consistent. They currently have the 3rd best defence in the league and are still able to match it against the best offensive teams in the NBA, as shown by their win against Miami. This could very well be the last year that these three are together. Free agency and Danny Ainge could tear the Big Three apart, as early as next season. But if there’s one thing these Celtics have, it’s pride and they will want to go out with a bang. No team will want to play the Celtics, this team knows how to win in playoff time and always seem to have that extra gear to go to. Jordan Crawford’s 28 points were not enough to lift the Washington Wizards over the Indiana Pacers. Danny Granger’s 20 points led the Pacers to a 109-96 victory. The Spurs survived Boston’s late game charge to win by 1 point. Avery Bradley lead all comers with 19 points off the bench while Danny Green had 14 points for the Spurs. The Hawk’s bench had 52 points as the Atlanta Hawks blew out the Charlotte Bobcats by 27 points. Rookie point guard Kemba Walker had 21 points in the loss. Monta Ellis had 30 points and 8 assists as the Milwaukee Bucks consigned the Cleveland Cavaliers to yet another defeat. Ekpe Udoh got the start for the Bucks as likely RoY winner Kyrie Irving sat out for the Cavs. David Lee’s 31 points proved too much for the Timberwolves as they lost 97-94. Kevin Love had 29 points and 12 rebounds but there wasn’t a great deal of help from a short handed Wolves team. 6 players scored in double figures for the Hornets as they beat Ty Lawson and the Denver Nuggets. Lawson had 22 points but it wasn’t enough for the Nuggets as they lost by 2 points. 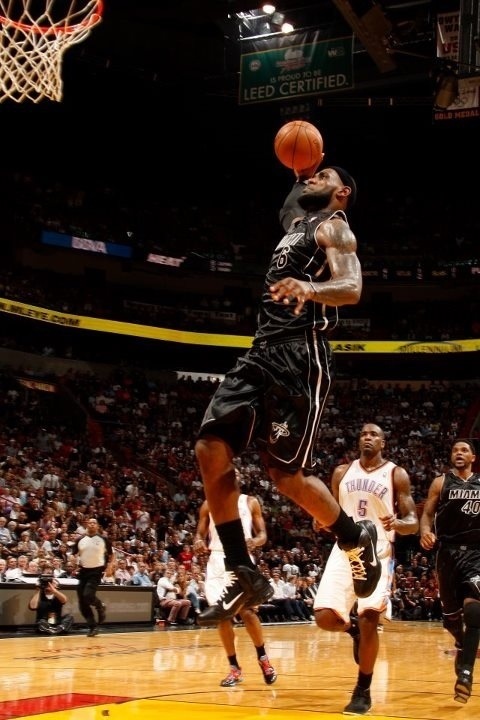 LeBron James had 34 points and 10 assists as the Heat evened the ledger against the Oklahoma City Thunder. Kevin Durant and Westbrook combined for 58 points, but also had 13 turnovers, 9 of them Durant’s. Dirk Nowitzki had 23 points and Jason Terry had 15 points off the bench as the Dallas Mavericks used a big 4th quarter to defeat the Memphis Grizzlies. OJ Mayo continued his push for a start, leading the Grizz with 17 points off the bench. Gilbert Arenas had 8 in the loss. Despite two 20 point games off the bench from Anthony Morrow and Gerald Green, the New Jersey Nets lost to the Portland Trailblazers. LaMarcus Aldridge had 24 points for the Blazers while Nicolas Batum had 20 points and 10 rebounds. Steve Nash hit the game winning layup as the Phoenix Suns took down 8th seed competitor Utah. Michael Redd had 19 points off the bench for the Suns. The Los Angeles Lakers took a 2 game lead in the Pacific Division, winning by five. Andrew Bynum lead the way for both teams with 36 points, but it will be Blake Griffins ridiculous poster dunks that will steal the headlines. Caron Butler led the Clips with 28. Which team has the best backcourt in the NBA? A trade deadline union, Kobe and Sessions form a dangerous pair going into the playoffs. Whilst they haven’t seemed to gel as easily as Jennings and Ellis, Sessions has energised the previously sluggish Laker offense. Although Kobe seems to want Fisher back, that could only be for personal relationships, as Sessions has brought a palpable improvement to the Lakers. The Lakers are scoring at a much greater rate and Sessions is establishing himself as one of the better point guards in the NBA on the big stage. As for Kobe Bryant, there’s not a lot to say. He is the best player at his position in the league, he is scoring at an astronomical rate and despite the supposed issues between him and coach Mike Brown, the Lakers are winning. They currently hold the 3rd seed in the West, behind only San Antonio and OKC. Bryant’s leadership through the coaching rumours and issues were vital, not letting it get out of hand and never suggesting that the locker room had turned on Brown. Sessions and Bryant are turning into one of the more dynamic backcourts in the league. When it comes to the Milwaukee Bucks-speed kills. With both Jennings and Ellis, the Bucks have one of the fastest backcourts in the NBA. These guys can get up and down the floor rapidly and are great scorers on the fast break. Jennings also appears to be rejuvenated by his new backcourt mate and they have formed one of the best guard tandems after the trade. 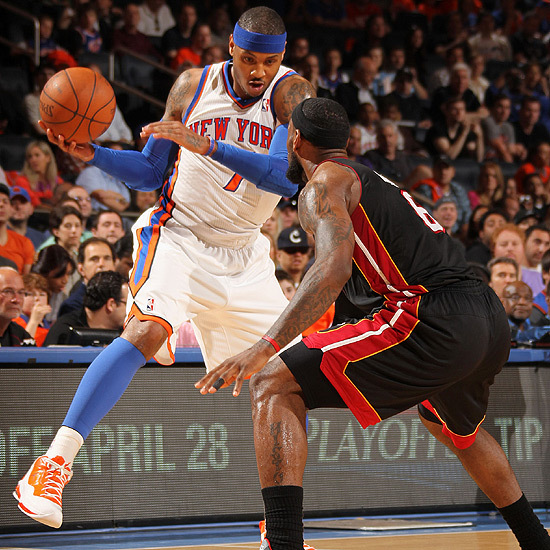 Their continued success is vital to the Bucks’ push towards taking that 8th seed in the East off the New York Knicks. Whether or not they can make any kind of upset against the Heat or Bulls is unlikely, but they very well could steal a game off them. They both play the passing lanes to the highest level, putting their speed to good use. Whilst Monta Ellis especially is quite undersized for his position, he fights hard on defence, especially after being united with defensive minded Scott Skiles. One can barely shoot and the other is the greatest three point shooter the game has seen, yet these polar opposites complement each other wonderfully to form one of the best backcourt pairs. Like most of the Boston Celtics, they seem to be on the same wavelength, always seem to know where each other are going to go. Rondo will always know where Ray will be going on the fast break, and just as, if not more, important will always put the ball perfectly in Rays shooting pocket. This helps a shooter to no end, the very art of shooting based around repetition. Getting the ball in the same place every time means there is one less thing for Ray to worry about. He only has to worry about taking the shot. Rondos passing is one of the big reasons why Allen is still shooting at a high level. Whilst Ginobli has been unhealthy for most of the year, the veteran championship pair is still amongst the best. Parker has been playing at an MVP level and is now the heart of the team. Ginobli fights for every step on defence and is still one of the most dynamic scorers in the NBA. You have to respect his deadly jump shot, but if you close out poorly he will get around you and find a way to the hoop. Parker is playing close to career best basketball and is keeping the Spurs and Tim Duncan relevant. The Spurs contention this year rests on his shoulders. The Dynamic Duo for the Oklahoma City dominated the Chicago Bulls as they easily encountered for the Eastern Conference leaders. Westbrook had 27 points while Kevin Durant closed in on Kobe Bryant for the scoring leader on the season with 27 points and 10 rebounds. All five starters scored 10 points or more as the Boston Celtics had a huge win against the Miami Heat, winning by 19 points. 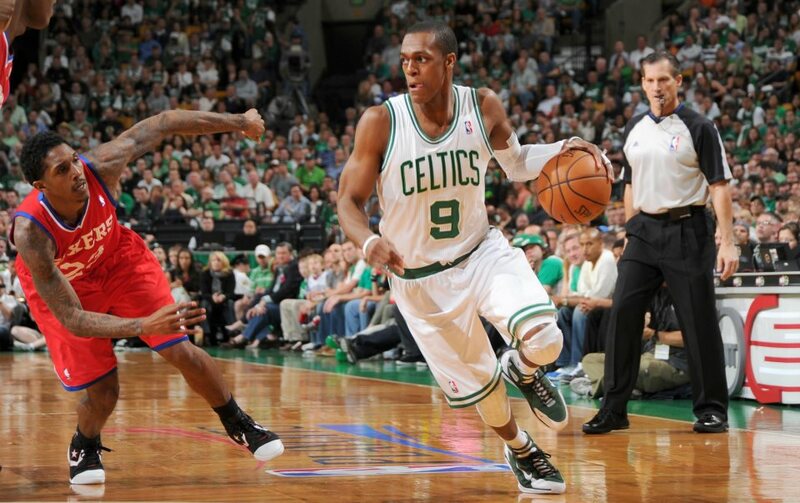 Rajon Rondo had a big triple double with 16 points, 14 assists and 11 rebounds. Paul Pierce had 23 points in the win. Arron Afflalo and Ty Lawson had 22 points and 25 respectively as the Denver Nuggets took down a Dwight Howard-less Orlando Magic Jameer Nelson led both teams with 27 points and 5 assists, but it wasn’t enough for the Magic to win. Danny Granger’s 32 points pulled the Indiana Pacers over the Houston Rockets in overtime. 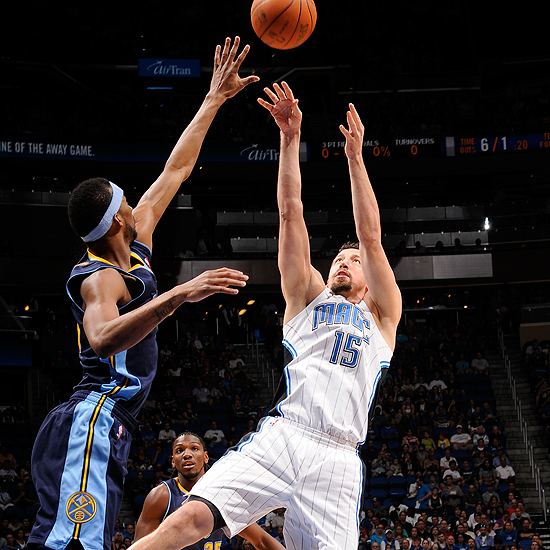 Courtney Lee had 20 points while Goran Dragic had 22 points and 6 assists in the two point loss. Jared Dudley had 21 points and Steve Nash had 14 assists as the Phoenix Suns defeated the New Orleans Hornets, despite Grant Hill not playing. Marco Bellinelli led the Hornets with 14 points. In a match up of two of the best forwards in the NBA, Kevin Love’s Minnesota Timberwolves fell to LaMarcus Aldridge’s Portland Trailblazers. Aldridge had 26 points while Nicolas Batum had 24. Mr Bryant, take a bow. Barely 24 hours after his horrible performance against the Hornets, Bryant scored 40 points in the Lakers win over the Golden State Warriors. 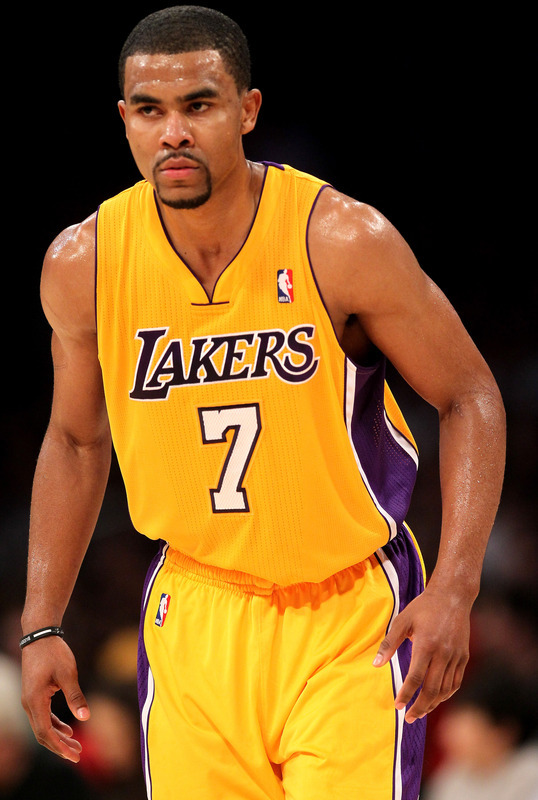 Ramon Sessions seems to be fitting in well with the Lakers as well, scoring 23 points and dishing out 9 assists. David Lee had 27 but shot the ball poorly.